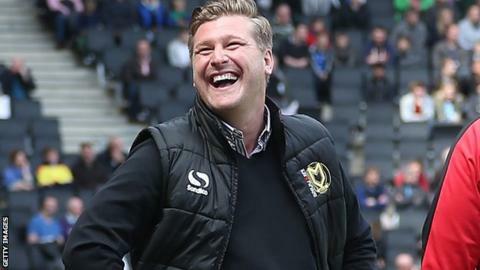 MK Dons manager Karl Robinson says he is "humbled" by the way his club have begun life in the Championship. Robinson's side beat Rotherham 4-1 in their first-ever game in the second tier of English football, having come second in League One last season. "I'm really humbled by the players' performance today," he said. "The fact we're the team that are tipped to go down and finish 24th in the league is tremendous motivation for us," he told BBC Three Counties Radio. Robinson was just 29 years old when he was appointed manager of MK Dons in 2010, but the former Liverpool academy coach guided the club to four top-10 finishes in League One, including two play-off campaigns, before promotion in May. But Robinson, who is the longest-serving manager in the Championship by almost two years, is realistic about his side's prospects of staying at the top of the division in the long term. "We know where we're at financially. We don't need anyone else to tell us that we're at the bottom, but we are, and we just push that to one side and do our business," he said. "We are where we are today because of our work ethic and our togetherness. "There's no one player at the football club who's bigger than anybody else, but together we're very strong. "Individually we're not as good as most teams in this league, but by sticking together we'll do OK."